Jeremy Stamper said his wife Justice cannot remember their big day. camera (Kayla Williams) The couple plans on renewing their vows on their one year anniversary. Jeremy Stamper said he was heartbroken when he learned that his wife of just a few short weeks, Justice Stamper, had forgotten the details of their wedding day after losing her short term memory in a car crash. 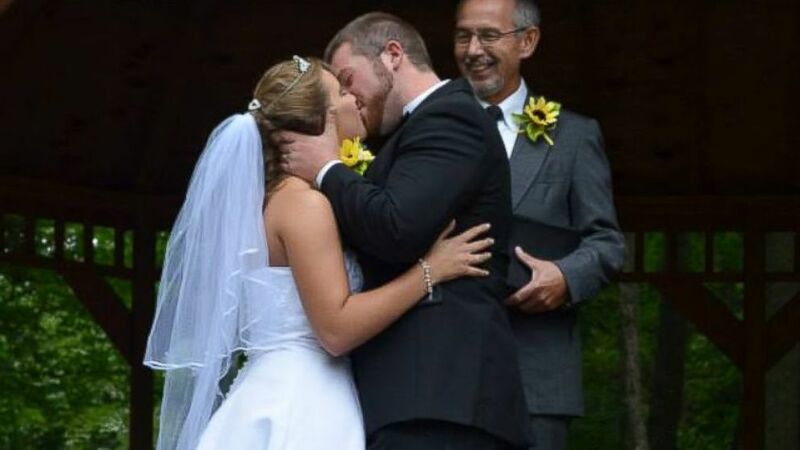 "She finally came out and told me she didn’t remember the wedding," Stamper of Bristol, Tennessee told ABC News. "I said, 'Don’t worry about it. We’re going to do it again.'" Stamper, 21, said he and Justice met at their Sunday school church back when they were just 10 and 11 years old. After years of separation, the two rekindled their relationship in their high school years. (Kayla Williams) Jeremy Stamper said his wife Justice lost the memory of their wedding day. "She asked a friend for my number and we hit it off ever since," Stamper said. "I guess you could say it was a childhood crush. I thought she was the cutest thing ever. 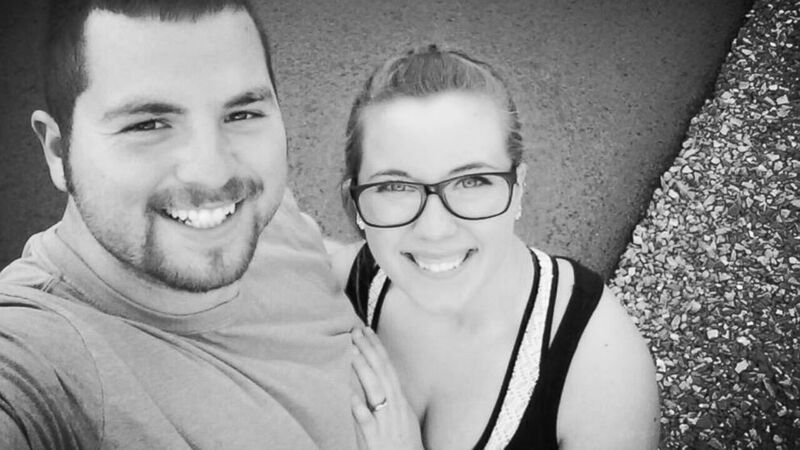 We dated for 11 months and then got engaged." Following a two-year engagement, Stamper and Justice officially tied the knot on August 1, 2014 among 70 friends and family members. "It was a country sunflower theme," Stamper recalled. "It was absolutely perfect." On August 20, just two days before the couple was scheduled to move into their new apartment, Stamper said his wife Justice, 20, had a frightening car accident in Virginia that left her with slight memory loss. The collision, Stamper said, occurred shortly before 1:15 p.m.
"She called, but all I could hear was her crying her eyes out," Stamper recalled. "I don’t remember anything after that. I got in my truck and flew over as fast as I could to see if she was OK."
Justice was rushed to Smyth County Community Hospital in Marion, Virginia, where Stamper said she was released after one day. When her symptoms did not progress, Stamper said the family's physician diagnosed Justice with a concussion. Justice's therapist, Denise Miller, Stamper said, had diagnosed her post traumatic stress disorder. The hospital would not comment on the case when reached by ABC News, citing that privacy laws prohibit them from releasing patient information. (Courtesy Jeremy Stamper) Justice Stamper was in a car crash on August 20, 2014. ABC News was unable to reach Denise Miller for comment. 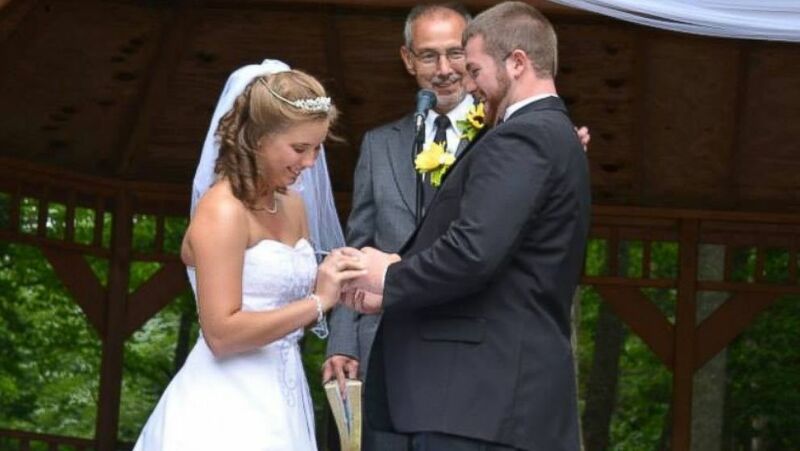 As she began her recovery process, Stamper said his wife revealed that she was unable to remember what would've been the most memorable day of her life -- their wedding day. "When she said she had memory loss, the doctors said it could come back and it might not," he said. "Signing our lease, renting our apartment, the planning, all that stuff she has no recollection of. 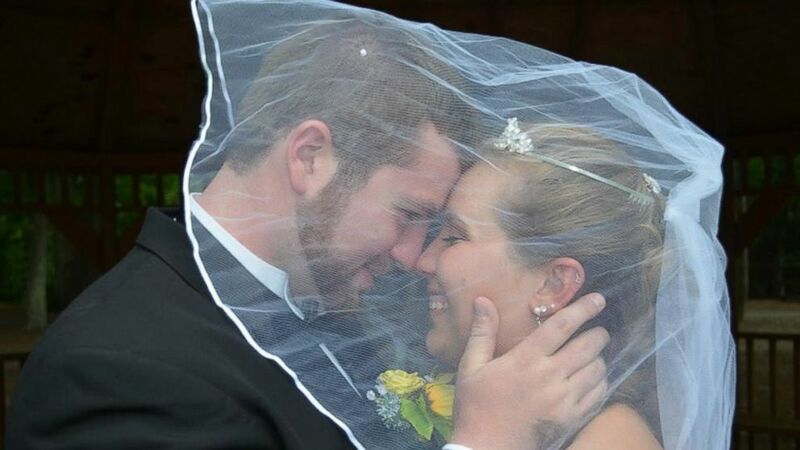 "She looked at the [wedding] pictures and she saw the video, but she said it drew a blank. It would only upset her." Saddened by the news, Stamper promised his wife another wedding, which will take place August 1, 2015 -- the same day as the couple's one year anniversary. (Kayla Williams) Justice will wear a wedding gown different from her first. While she said she's excited, Justice recalled that she was completely shocked when her husband told her she would be a bride once again. "He never cries, but since the accident he’s become so sensitive," she said. "He's just a big, old, gentle, giant. "I'm absolutely looking forward to seeing his face when I come down the aisle," Justice added, with a laugh. "That is the moment I want to see." Among 150 guests, the Stampers will renew their vows at the original venue, only Justice will don a gown different from her first. Following their repeat nuptials, the couple said they will enjoy a six nights in Myrtle Beach -- a honeymoon gift donated by both their photography company and local radio station. After one year of marriage, the Stampers said they'd like to fulfill their dream of having a family. “One kid and then I want to adopt a bunch of babies," Justice said. "We will have to go all '19 kids and Counting,'" Stamper chimed in. "We want to take in those memories that most people take for granted," he added. "They go through it, but don't cherish them like they should. Hold onto them as if they're the last things on earth because if they go away, it's terrible."